0 Comment May 8, 2018 Like? We are thrilled to announce a brand new plugin for OBS streaming, pan, tilt, zoom, control. In this video we will demo the plugin and go through how to implement the plugin. This new PTZ camera plugin for Open Broadcaster Software is now available at https://ptzoptics.com/OBS . The pan, tilt, zoom control plugin is built specifically for PTZOptics cameras and Open Broadcaster Software (OBS) users. Open Broadcaster Software is the industries most popular live video production software with millions of users around the world. The PTZOptics camera control plugin will be available for free, bringing professional camera controls directly into the software. “With millions of users, our free OBS plugin has the power to transform video productions around the world” says Paul Richards, PTZOptics Chief Streaming Officer. 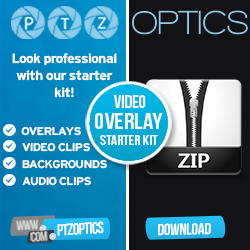 “We currently have thousands of customers using Open Broadcaster Software who can now simplify their video production workflows with this PTZ camera plugin.” The PTZOptics OBS plugin is now available on the PTZOptics downloads page along with the camera companies popular open source control software.